Cook the sausages in a Johnsonville Sizzling Sausage Grill according to grill directions. Cut the sausages into slices. Melt one tablespoon of butter in a large pan over medium high heat. Add the peppers and season with salt and pepper to taste. Cook for 5-6 minuted or until peppers have softened and are lightly browned. Remove the peppers from the pan. Add the remaining tablespoon of butter and onion to the pan. Season with salt and pepper. Cook for 5-6 minutes or until onions are softened. Add the tomato sauce and Italian seasoning to the pan and bring to a simmer. Drain the pasta and toss with the tomato sauce. 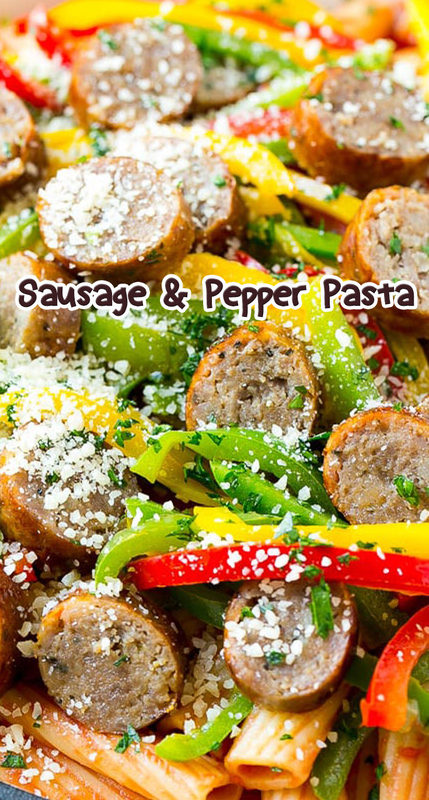 Arrange the sliced sausage and peppers over the pasta. Sprinkle with parmesan and parsley, then serve.